Christmas and the New Year are always a time for reflection and nostalgia and more importantly, eating so much Quality Street that chocolate bubbles up your nose whenever you hiccup. Good times. But with it, there's always that tinge of regret that it can never be quite like it once was; when Santa seemed possible (instead of, as we all know, quite real) and packages under the tree were little parcels of magic and surprise instead of quite probably socks. It's natural, I know. But I regret that I can't ever see myself being as excited, as pumped up, as shaking-magazine-pages-to-make-the-screenshots-move as during the 90s, waiting to crack open games like Day Of The Tentacle or Grim Fandango, or Street Fighter II for the SNES. As far as games go, I'm not sure anyone quite does any more. Not in the same way, at least. Oh, I'm not saying that kids don't get excited to rip open presents or anything like that, just that when it came to computers and gaming, there was something distinctly more magic about them back in those days that we don't really have any more. Going into an arcade and fantasising about a day when games like that would be playable at home for instance. Mags like C&VG seemed the luckiest things on Earth to have access to systems like the Neo Geo, with each review not so much buying advice as a brag that yes, they had £200 worth of game right there and could play it and all you could do was sniff the paper and try to get a whiff of its quality. That raw sense of magic hasn't been around for many years now. Yes, the NES and the SNES were technically upgrades, but they also had that primitive impossibility to them - something as simple as a Mode 7 effect or the allure of 'blast processing' speaking of a whole new world of technology and experience. It didn't hurt that in most cases, the games of the age were distant, typically untouchable things. Perhaps there was a demo unit at a nearby Toymaster or similar… I know my love of the NES was sparked by a demo at a department store in Harrogate where you could play five whole minutes of games like Mega Man and Castlevania 2 and Solar Jetman… but for the most part you were on your own. There was no YouTube to show off every secret and glom onto. The closest was if a game you wanted was lucky enough to feature on something like GamesMaster, and you'd get maybe 30 seconds of actual footage to record onto VHS and rewatch until the tape ran thinner than the plot of a Scooby Doo cartoon. I suppose in a way, I'm lucky that my nostalgia is still a living, breathing thing that I can dip into more or less whenever. The NES, the SNES, the Mega Drive (or if you prefer, and don't mind being wrong, the Genesis) all have a special place in internet culture's heart. 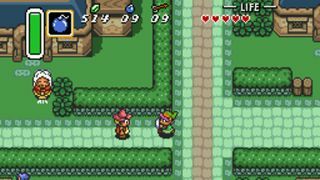 With constant returns to classics, games like Zelda: A Link To The Past are still hailed as among the best games ever made. Of late, the push towards recapturing an era on things like Kickstarter and in indie games like Shovel Knight for platformers and Undertale for JRPGs, and of course, the upcoming Final Fantasy VII remake. Don't get me started on the dreadful PC port of Final Fantasy VI, mind you, since I'm not really allowed to swear here and so must remain quiet. But I do often wonder what, if anything, will supplant this nostalgia. Individual games for systems like the Playstation 2 get a piece of it, but there never seems to be the full, all-encompassing wave of it that not only appeals to those of us who were there at the time, but the next generation that hooked onto it. There, it seems to tap out largely around the introduction of the Nintendo 64, primarily for Mario 64 and Ocarina of Time.